Bohl said UW true freshman kicker Cooper Rothe had a good day, making all of his field goals and extra points. He also said there were no serious injuries, however, sophomore starting right guard Kaden Jackson hurt a knee, but later returned to practice. I talked with sophomore free safety Andrew Wingard after practice, and even though he is still limited with a strained hamstring, he is getting better and is expected to be ready for the opener. The plan for true freshman quarterback Chandler Garrett is to redshirt this year. However, Bohl said he will split snaps with UW’s offense and with the scout team throughout the season. Technically, Garrett will be the Cowboys’ No. 3 quarterback this season. UW ends fall camp with a scrimmage at 10:30 a.m. Saturday, which is closed to the public and media. “It will be a game-like situation. We will have officials. All the coaches will be on head sets. We will go through our substitution patters. It will be as much of a dry run as we can get,” Bohl said. Prior to the scrimmage, UW will announce its team captains. Bohl said the captains are voted on by the players. “That’s probably the highest honor a player can receive is to be put in a position of leadership chosen by his peers,” Bohl said. Any guesses who the captains will be? My guess is senior offensive guard Chase Roullier, redshirt sophomore quarterback Josh Allen, senior middle linebacker Lucas Wacha and senior wide receiver Tanner Gentry. 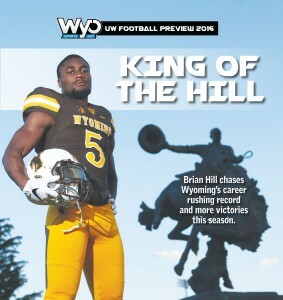 However, I wouldn’t be surprised if junior running back Brian Hill is voted a captain by his teammates. Here is more of what Bohl told the media after Thursday’s practice. My story for Friday’s Wyoming Tribune Eagle, Laramie Boomerang and wyosports.net is on redshirt freshman linebacker Logan Wilson of Casper, who has changed positions each of his last three years of competitive football. UW has high hopes for Wilson. And, be sure to pick up a copy of the WTE and Boomerang Sunday for WyoSports’ 68-page UW football preview section. Lots of good stuff there. Here is the cover, and an idea what the theme of the section is all about. This entry was posted in Football and tagged Andrew Wingard, Brian Hill, Chase Roullier, Cooper Rothe, Craig Bohl, Josh Allen, Kaden Jackson, Logan Wilson, Lucas Wacha, Tanner Gentry, University of Wyoming, Wyoming Cowboys, Wyoming Football by Robert Gagliardi. Bookmark the permalink.